Percy was a pug, and Petunia was a pig. lapping puddles cheek to cheek. Thunder Pug is the story of Percy and Petunia, a pug and a pig who are the best of friends. Some of their activities are the same but they also do pug and pig things on their own. Percy is perfectly happy waving goodbye to Petunia when she goes off to the fair. But, when she comes home with a blue ribbon and wears it everywhere, Percy starts to get a little envious and lonely because Petunia doesn't have time for him, anymore. Then, he happens across a comic book. "Thunder Man" is the star of the comic book and reading about him gives Percy an idea. Petunia has her blue ribbon; Percy can have a cape! He starts wearing a cape and doing good, but he isn't satisfied. Then, he realizes what's missing. He needs a sidekick. Enter Pink Lightning, Petunia in her blue ribbon and a cape. Together, they set off to save a young raccoon dangling above a patch of prickly plants. They manage to rescue the raccoon (sort of) and get tangled up. But, everything is better with a friend. Highly recommended - This is going to sound weird for a "highly recommended" book, but the first time I read Thunder Pug, I was disappointed. I love the illustrations but I just didn't get the point of the story. It felt like there were too many ups and downs. This is good, but that's unsatisfying, etc. I was a little baffled by the fact that there are two spreads that rhyme while the rest of the book does not. So, I decided I needed to read Thunder Pug aloud to see if that made a difference. And, it definitely did. 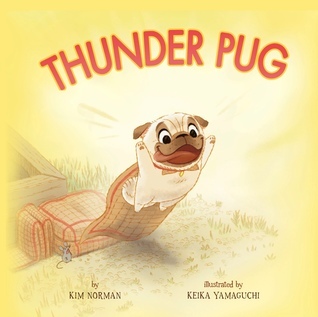 Thunder Pug is easy to dramatize and when read aloud even the blend of non-rhyming and rhyming bits suddenly made sense. I found myself pointing at things and asking the cat questions, just like I would a child. I even laughed a couple times. The cat wasn't very responsive, but I discovered that Thunder Pug is a book that just needs to be read aloud to be appreciated. Now that I know how fun it is to read, I'm planning to drag my copy of Thunder Pug along to read to the grandchildren, when next I see them. My thanks to Sterling Children's Books for the review copy! This book look so darn cute. I must buy it for someone.